I did it! We did it! Clodia, all those who gave something to this journey, passion and water, and me. We arrived in Byzantium, Constantinople, Istanbul. It’s been more than two years from the very beginning, from the first flash of the idea, the dream with open eyes, watching with respect and apprehension every small creek in front of us. A thousand travels by train, bicycle and on foot. The sleepless nights working with Pati de Ross, a great friend. The worn out shoes. The thousand of “not” from people who could not or would not help, the disappointments, the hugs, the angels who helped me immediately and unconditionally, the selflessness and love, generosity, and my many mistakes. Everything was great and part of a real project. 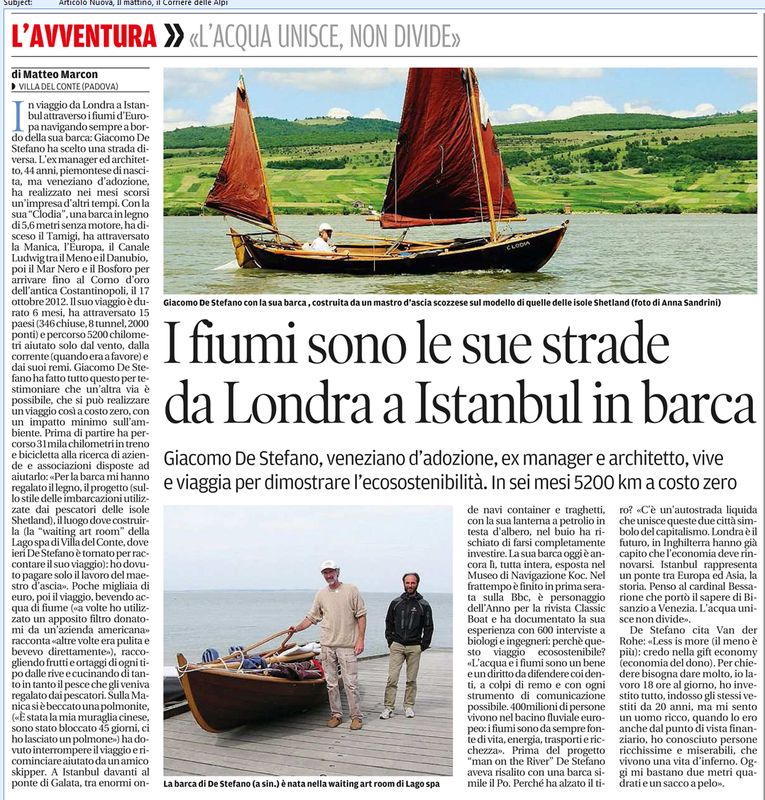 I remember the start, with Jacopo and Massimo Di Nonno, who photographed, and Nicola Pittarello who was filming in the cold wind of the Thames. The freezing nights, well below zero, in England, the 20-day wind at 40 knots, straight from the Arctic, the horizontal rain, the fire of the Shipwright’s Arms pub to dry my wet clothes, the disease, the four months between hospital and bed, the Danube frozen. The second stop was not planned but neither the first was, to tell the truth. 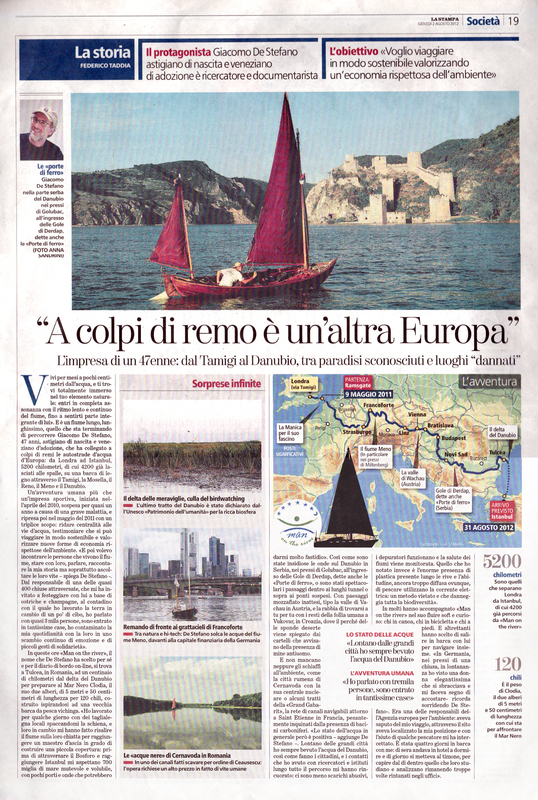 And then the 346 locks, the 18 aqueducts, rowing or sailing suspended 30 meters in height, the 8 tunnels, 2000 and more bridges and 5401 km of joy, suffering, and a lot of wind and water, underneath, beyond and sometimes inside Clodia. And sailing and rowing so much. Never give up. All the way till the end. But where is the end? And many stories that I don’t know how to tell you. The English Channel… Fantastic and frightening, the North Foreland, with its history, 7.000 wrecks and its currents and shoals and seals, the estuary of the Thames. And still: The mines of Croatia, the misty and “Viking” Austrian mountains, the friends of Dunakeszi, they were angels, Romania and the billions of mosquitoes and pelicans in the Danube delta. And the “Russian sharks” and the astonishing Serbian, Hungarian and Bulgarian women. And the plastic, cool, smart material, but polluting and hurting when littered, and the beauty that tears my eyes and blinds me in the light of a sunset over a forest suspended in a golden mist, mirrored in the green Danube. And the arrival at night in Istanbul with a small paraffin storm lamp at the masthead, that others do not see; the waves and the lights of the Bosphorus. And an immense light that illuminates the eyes and hearts of those who listen to you because they understands that it is really true what you say. And the sirens of the ships of the Golden Horn playing for us, and I Clodia. A real blowing Goden Horn! In honor of us!! And of all the friends. Marino, who hosted me since my return from the Po river, in 2008, and Emilio and his anchor and the bilge pump that saved my life. Jacopo, Nicola, Silvio, Ali, Roland, Lory, Daniele, Nicholas, Bob, Leena, Alistair, Jean, Francoise, Anne, Franz, Heinz, Tim, Viktor, Dragan, Nikolay, Emanuele, Imre, Laszlo, Aggy, Bruno, Josephine, Anna, Leon, Paolo, all the staff of the museum Koç and then Sandro, Andrea, Barbara… How can I write all of them, and especially how to describe it all? I’ll try in the book. And my parents, Marisa and Beppe, always waiting and ready to help me, unconditionally. And many others. The Venturieri, the fishermen. 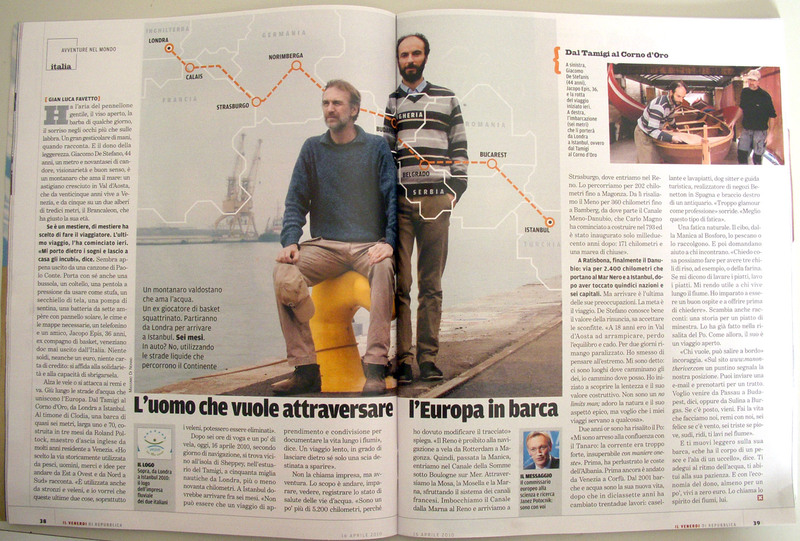 The people from Chioggia. The people from Clodia. 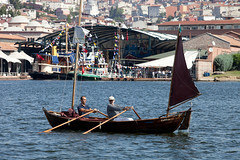 We left, and sorry for being so late, in the bay of Poyraz, the entrance to the Bosphorus. It was September 22. Golden sunset in Asia. 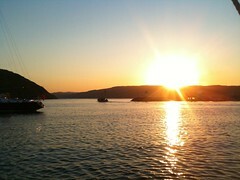 After a cold night in the morning I get woken up by the notes of the muezzin, and the sun rising in the bow of Clodia. The wind is from the east. The great architect has studied well the awakening of Clodia and of its captain/mate. Today I turn 47 years old. The fate gave me a beautiful gift. It is not over! Ruta and Saulius welcome me with a wonderful dish with bonitos, donated by two fishermen, some herbs set with care and fruit, figs, of which Saulius like me is particularly fond, risking life (and sometimes jail) to collect them from anywhere. The Byzantine fortress looks at us, now relaxed. After breakfast with Ruta and Saulius, Bruno and his girlfriend Samile come. 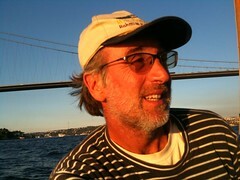 Bruno Cianci is a great friend, a journalist, photographer and sailor. 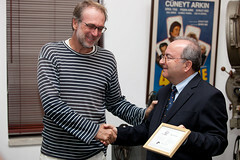 He invited us two years ago at Koç Museum in Istanbul, in the Golden Horn, to end our journey. Things have been longer than expected but Bruno and staff I have been waiting patiently. Now we finally hug a few miles from Istanbul. And it’s magical. Samile is a gem of kindness and sympathy. They give me a valuable book: Meander, by Jeremy Seal. The story of a canoe trip down a legendary river and its history. Second breakfast. We land illegally, but common sense here, for the moment, is better than bureaucracy. Just smiles and handshakes. Olives, tomatoes, cheese, eggs, chay (tea) and smells that take me back home. Ena Faza, ena raza .. (One face, one race) say the Greeks of the Mediterranean. Although there is no place, historically and anthropologically, more varied and diverse than the Mare Nostrum, so pompously called by the Romans. And even if there we aren’t still in, we can already feel its charme. Something that we have to share. Perhaps this water. And right here, leaning from the docks or from boats in days of dead calm, the faces mirrored in the water are the same. They feel as “one” Arabs and Vikings, Turks and Venetians, Dalmatians and Albanians. Bruno seems an Ottoman sultan, from now on he’ll be Cianchmet the second, given the fact that we spend some time under the fortress of Mehmet the Second, conqueror of Costantinople. Bruno tells me that we have to leave. We are waiting for the entry documents. In an hour we get ready. Clodia is happy. The wind is favorable from the east. Great! We sail, though it is forbidden, they tell me. The wind is about 10/15 knots, just about perfect. We sail on a transparent blue Bosphorus. Large ships, oil tankers. Spectacular nature. Then some signs of civilization approach. The buildings are concentrated on the precious shores. The current increases, but never reaches the 6-7 knots that many guides report. Much depends on the winds and high and low pressure regulating this strait that connects the Black Sea to the Marmara Sea and then, across the Dardanelles, to the Aegean and Mediterranean. We sail under two large suspended bridges, at full speed. Some rude and noisy boats make gigantic waves. We embark some water from the bow. Clodia is fantastic, as always. Bruno is at the helm, as Bruno Porto who drove me safely across the English Channel. At Kabatas, the dock of thousand ferry boats crossing the Bosphorus on the European side to the Asian, the traffic is dense. The short waves are very unpleasant. Potentially, a very dangerous situation. It’s getting dark. A small tug comes close and picks up the passport. Maneuver is not easy. We risk a collision, also because the pilot is inexperienced. It would be easier if he wouldn’t approach at full throttle, making waves. All of this was organized with generosity and accuracy of the Koç Museum. Even for Carina, which has remained in Poyraz. The first 15 miles (27 km) just took us 3 hours. For the remaining 3 miles I have to row, and it will take another three hours. Dark, the situation is as suggestive as dangerous. My navigation light is a paraffin storm lamp, which is hoisted at the masthead. Not all the boat can see me. Two ships huddle and point us. Terror! At the end the largest and fastest, with a sudden maneuver, is able to avoid the clash. There is an annoying countercurrent, the waves do not help me. Finally I see the Galata bridge that marks the entrance to the Golden Horn, Haliç, probably the oldest and largest natural harbor in the world, where Phoenicians, Persians, Greeks, Romans, Vikings, Genoeses, Venetians, English, Turkish, and many other moored their ships. 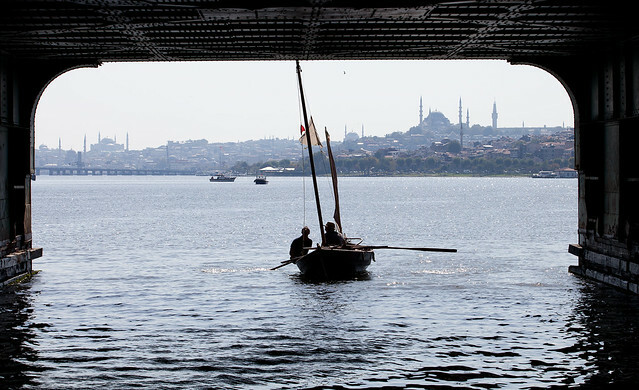 Past Galata and its lights, restaurants, the sounds and the thousands of lines of fishermen (two or three take away with Clodia, steeeengg ….!) We are in the calm. 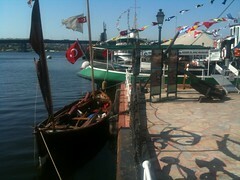 Almost no other boat around, when miraculously the thousand muezzin of Fener, Fatih, Galata, Haskoy begin their chant. We’re ecstatic. We are in the dark water, in a state of intoxication. Stoned!! Tired but irrepressibly happy. O the last bridge we have to tilt the boat to avoid having to remove the mast. Bruno gets on the side working as ballast. We’re 200 meters away from Koç Museum. A man with a steam tug Liman2 beckons us with a lamp. Old signal for sailors. I realize that I have arrived. I’m happy. And by some miracle a few tens of meters away I recognise a a song… I cannot believe… Loud, full volume: “Felicità”, Happiness! Albano and Romina!! I think of something arranged by the museum but Bruno tells me not. There’s a wedding party in one of the restaurants of the museum. Unbelievable! The great architect, or director and also D.J. placed his signature once again. I feel the gods close. Mosques and churches, saints and prophets. Five or six caring staff of the museum help me to moor. But Clodia is so easy. Two ties and it’s done. I get down and kiss the earth. And kiss the water. And kiss Clodia. I prepare for the night. I set up the tent for the umpteenth time and check peaks and oars. I have arrived. Bruno will host me for 12 days at his home. Will be days of meetings, dozens of interviews by television and magazines from all over the world. Only the Italians are missing. I’m used to it. I repeat, on the 27th, the arrival for the press. The picture I love most is the last step, touched with the hand of Mr Duru, the courteous director of the museum Koç, wonder of our world, the museum that contains treasures of transport. 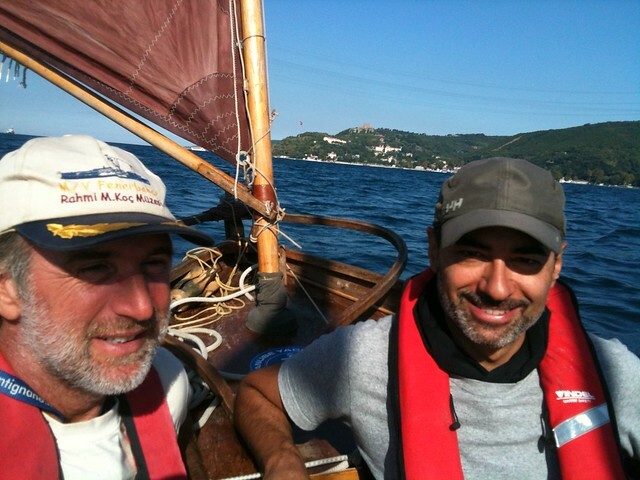 On board with me is Gianluca Alberini, Consul General of Italy, very nice and rowing very well from the beginning. A shame to have him as companion just on the end. Ruta, Saulius, Marty and Art came too, what a joy. A steam tugboat for the press was made available by Mr Duru, and it’s waiting for me at the exit of the bridge down. The consul is happy to became a ballast too, so we tilt Clodia. 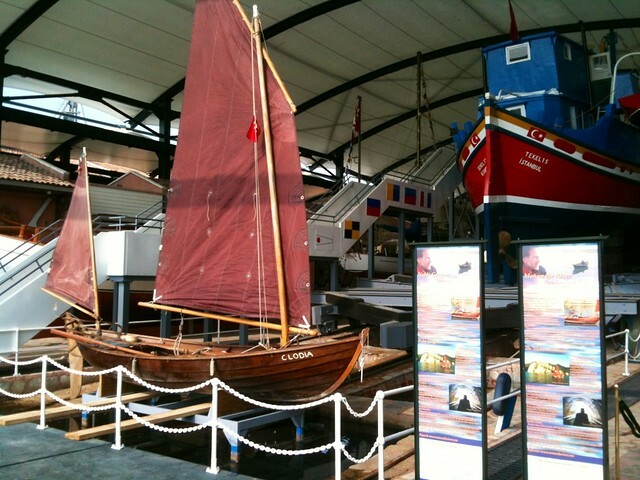 Then I hear the sirens of all ships and boat of the museum playing and honking on my honour, and we respond by raising Clodia’s oars… The excitement is immense, immense! It overwhelms me. I stop and I cannot proceed. I am 30 meters away from the dock and the risk of flooding Clodia with my tears is great. Be water my friend, be water. A wonderful ceremony, flawlessly organized, follows. There’s even a bee car of an Italian ice cream, Muà. Fantastic. Clodia will be displayed here. Immobilized for a while ’till spring. A rare honor. For three hours I answer a lot of questions in many interviews. Then more meetings. A break in Davide’s house, who lives within walking distance. I fall asleep for half an hour on the floor. Then more meetings in the following days. Dalia Mortada and Aly Neel, from the US, make me two good interviews. They are young and passionated for what is happening in the world and particularly in the Middle East. Dams in Turkey are destroying valuable ecosystems and ancient villages are a huge gash. A problem that devastates a country rich in water. Respect in Turkey is not as good it should, as its environmental and historical heritage is at risk. Some people lose everything. Many animals are killed. Water is not a commodity from which to profit. It’a gift, a right for all. To respect, protect, share, not to waste. 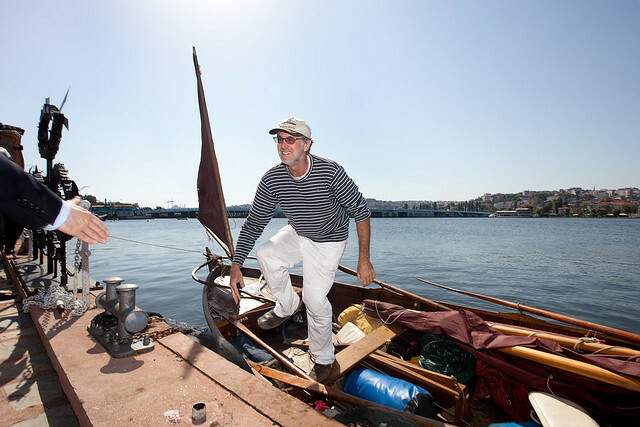 In my spare time, on the calm waters of Haliç harbor, the Golden Horn, I take the girls of the museum and others aboard Clodia. We have some extraordinary moments during the visit of two classes from different schools of Istanbul. Boys and girls are enthusiastic, full of respect and educations. They give me a hug and I understand that, getting aboard, they are thrilled by this crazy journey that was possibly unimaginable for them. Golden hours. I hope to give ideas and inspiration to those young hearts. To those eyes, to those beautiful souls. And they learn fast. When a team of super carpenters stes up the cradle for Clodia, that will be exposed here until spring 2013, I feel a strange sadness. Seeing her out of the water… I sit at her edge with love and touch the wood that has protected me for the last few months. 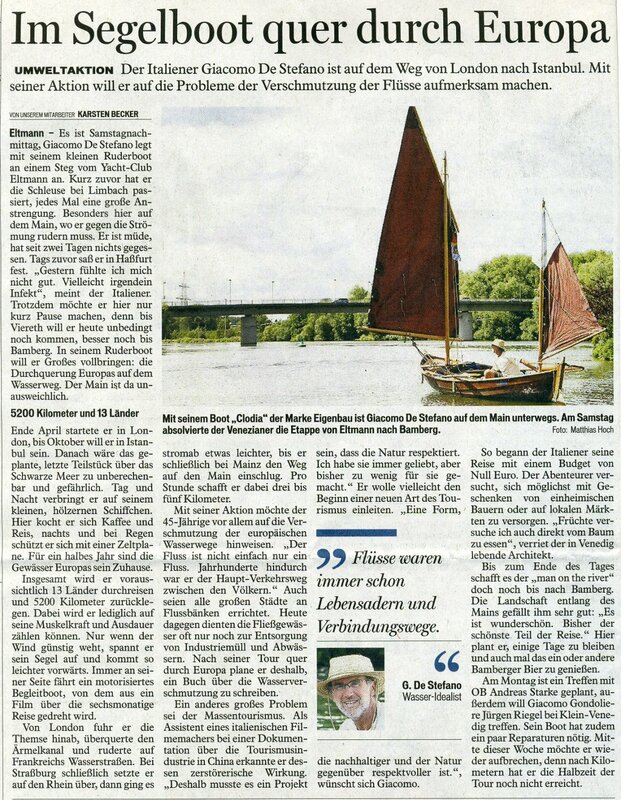 It ‘a great boat. 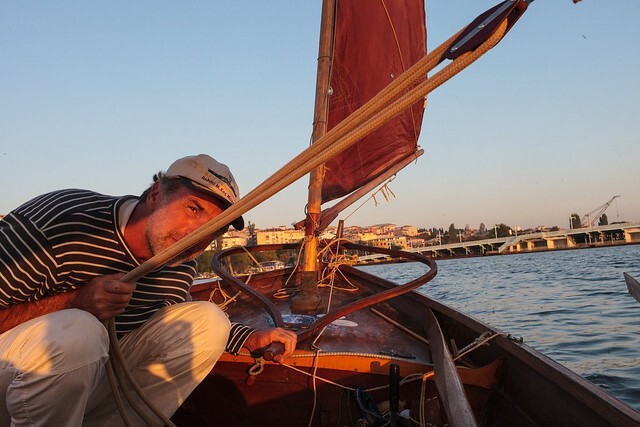 Thanks to Iain Oughtred, who designed the Ness Yawl, Roland Poltock and Silvio Lago who built it, Nicolò Zen who made the masts, Daniela Cometti and Ombra Renzini that stitched the sails and all our partners who provided the equipment for living and surviving along the 5.401 km of water from Wargrave to Istanbul. You can see all of them in the dedicated page of this website. Emanuele and the guys at Eden Exit still work hard, in silence, to publish these posts that have allowed me to communicate with you. They are precious. I’m glad I kept my commitment. Thank you. Thanks to the waters of the seas and to the rivers, they have moved and protected me, and subsided my thirst. Thanks to the air, wind, animals, all the wonderful people who have helped me. This planet is a miracle. Oh what an overwhelming finale. So pleased. Wish I could of been there. You are so special, my dear friend. My dear Earl, so glad to receive your message. i will come to meet you soon, beginning of Nov. Is it ok for you? PS: This trip is dedicated to you particularly. And of course I forgot to write it down in the post..my brain is jammy now..
What a end of trip my friend! Still hope that Clodia and the piano-bike will sit together & talk one to the other about their worlds between earth & water, looking to the sky straight on. They are still on, just beginning a second full life. And these echoes make me feel good. What a fantastic story! So happy that you made it safe and sound. There are many people who you do not know and whose faces you’ll never see who went with you. We are all with you now and so happy for you. I’ve always felt these presence aboard. Never alone. It has been an extraordinary experience. And Clodia now is safe till April in the Koç Museum in Istanbul. Do you have a Ness Yawl too I saw. I am so happy for you that you made it until Istanbul (though everyone tried to convince you not to go on the Black Sea)! I hope you have some time now to enjoy Istanbul with the great people you always meet. Say Hello to Ruta and Saulius, of course! I would like to be there with you! Thank you my friends Alina and Noel, I am so happy of hearing your words. You have been with me aboard Clodia.